Email us at fopcontact@gmail.com. We read each email and will write you back. Youhere.org is attendance supercharged using mobile-phones. How? Each student uses an app on their phone to self "check-in" to class. The Youhere server listens for check-ins from the app to compile an attendance log for you. Just announce ... "Check-in with you phone" ... to your students and your attendance will be done. If you have a large class, or deal with participants that are difficult to track, give Youhere a try. You'll love it. You: Make an account here, create a class, and configure your geofence. Students: Download our 100% free app (https://youhere.org/app) and use it to enroll in your class. Students: Use the app to check into your class at the right time and place. You: Use the attendance records compiled under your account. Yes! Location abilities (GPS, etc.) on a student's phone are used to verify their presence in your classroom. Does GPS attendance really work? Yes. Think of the last time you used Google or Apple maps on your phone. Were you impressed with how it always seemed to know your location? Youhere uses the same location capabilities as these mapping apps. If in doubt, try it for yourself. Tell this map where you are, then "check in" using the app as you move around. You'll see. What if a student doesn't have a phone? This is unusual, but some may forget theirs, or show up with dead batteries. We have many backup, "manual attendance" options. Students (free): Our app for checking-in (Apple App Store or Google Play) . Students never ever pay to use Youhere. Teachers ($19.99): Unlimited attendance for 12 months, after the 100 free check-ins have been used. Discount? Contact us at fopcontact@gmail.com for a discount on school-wide plans. When you start on Youhere, you get 100 free student check-ins. After that, pay $19.99 for unlimited check-ins across any number of classes you need, for 12 months. Your students never pay anything to check-in with the app. The app is free and there are no in-app purchases or charges later on. Who uses the website vs. the app? The website is for teachers (or group leaders), to set the geolocation and time(s) of their attendance needs. Attendance records are also compiled and available there. The app is what each student (or group participant) uses to check-in with their phone. We don't ask for any contact information on your students. We only log when a student successfully checks into your class. We do not log where a student is if their check-in is not successful. Want fully anonyminity? Have your students use pseudonyms, when they enroll in your class using the app. Student check-ins are collected into your Youhere account. There are many reporting options available to you. 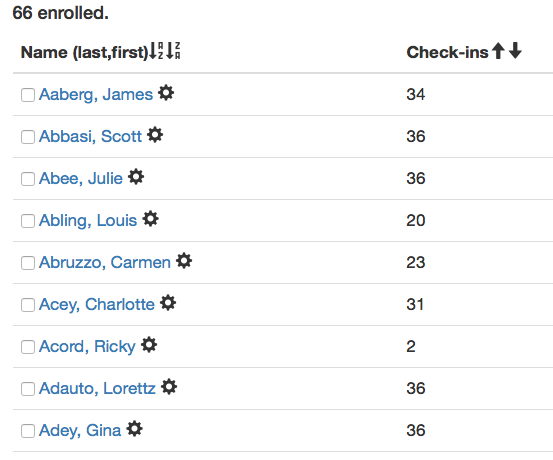 Every check-in collected for a given class of yours can be sent to you in a single .csv file. This will load into Excel, for example, allowing you to store, manipulate, and view your attendance data on your own computer. This may also be imported into your class management system. Small, copy-and-paste text-boxes are placed throughout the various reporting pages on our account. These allow for quick copying and pasting of your attendance records, into your own software (Word, Excel, course management software, etc.). Here is the most popular one, showing the number of times a student has checked-in. 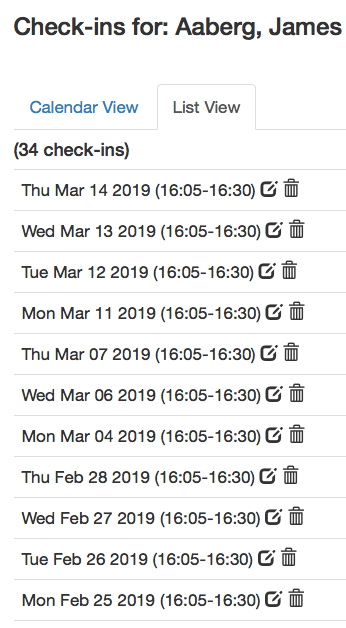 A class-wide calendar view is available, showing the total number of check-ins on a given day. A student-by-student look is available, showing how many total check-ins each student in your class has. 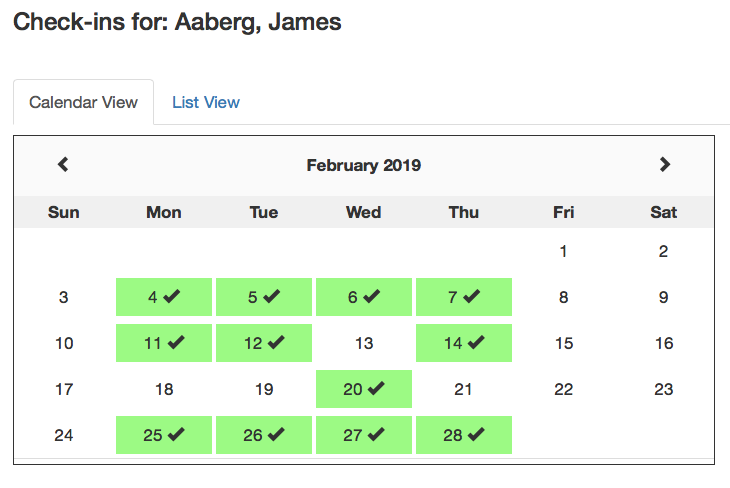 A calendar view for each student is available, showing the days a given student checked-in. A list view for each student is available, that shows the days a given student checked-in. Music teachers, to be sure students are going to practice rooms. Coaches, to be sure athletes are going to the track/field. Fraternities and sororities, to be sure pledges make it to study time in the library. Outdoor docents, rangers, and trail guides. Union activists at rallies and meetings. 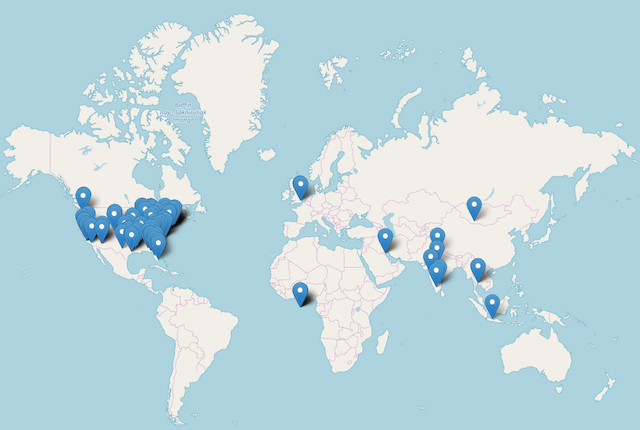 About 15,000 people per month check in using Youhere, from all over the world. Here is a check-in snapshot from a recent Tuesday.